WASHINGTON — Citing a shortfall of donations over the winter holidays, the American Red Cross put out an emergency call Monday for blood donors in the D.C. area. The nonprofit — which supplies about 40 percent of the U.S. blood supply — says it was down by over 27,000 blood and platelet donations through the weeks of Christmas and New Year’s. The Red Cross said it has less than a three-day supply of most blood types, and that a five-day supply is ideal needed to respond to emergencies and daily hospital needs. One of the reasons isn’t obvious to everyone: Blood goes bad. 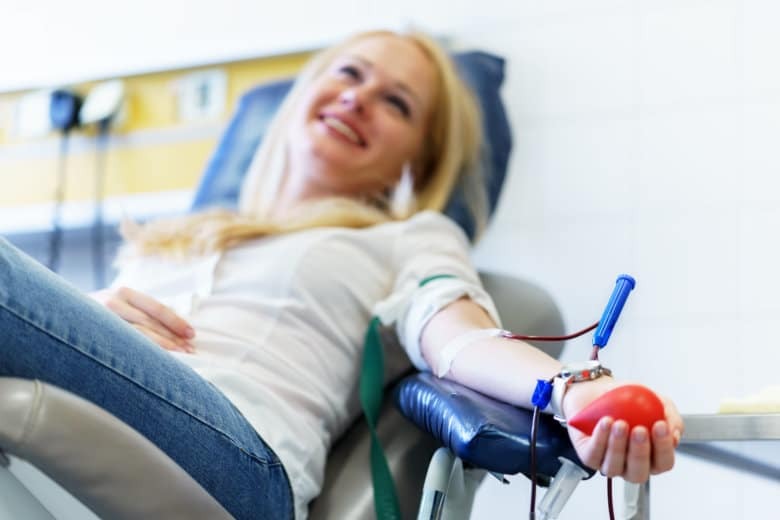 “Many people may not realize that blood products are perishable, and the only source of lifesaving blood for patients is volunteer blood donors,” said Cliff Numark, senior vice president of Red Cross Biomedical Services, in a news release. Winter weather itself presents a threat to the available blood supply. “Snow, ice and extreme temperatures last January and February forced hundreds of blood drive cancellations, causing about 23,000 blood and platelet donations to go uncollected,” the organization wrote. “We hope people can resolve to save lives now – when there is an emergency need – as well as throughout the year,” Numark added. There are a host of opportunities for residents to donate from Jan. 14 to Feb. 15. There is a blood drive search on the Red Cross website. They also have an app people can download. 1/19/2019: 8 a.m. – 1:30 p.m., Trinity United Methodist -Germantown, 13700 Schaeffer Rd. 1/19/2019: 10 a.m. – 3:30 p.m., Shrine of St. Jude Catholic Church, 12701 Viers Mill Rd. 1/22/2019: 11 a.m. – 4 p.m., Social & Scientific Systems, 8757 Georgia Ave.
1/27/2019: 8 a.m. – 1:30 p.m., Christ Congregational Church, UCC, 9525 Colesville Rd. 1/17/2019: 1 p.m. – 5 p.m., Navy Federal Credit Union, 7001 Berry Rd. 2/7/2019: 2 p.m. – 7 p.m., Baden Volunteer Fire Department, 16608 Brandywine Rd. 2/11/2019: 1:30 p.m. – 7 p.m., Knights of Columbus Prince George’s Council, 9450 Cherry Hill Rd. 2/12/2019: 1 p.m. – 6:30 p.m., Moose College Park Lodge 453, 3700 Metzerott Rd. 1/18/2019: 12:30 p.m. – 6 p.m., Greenbelt Community Center, 15 Crescent Rd. 2/15/2019: 12:30 p.m. – 6 p.m., Greenbelt Community Center, 15 Crescent Rd. 2/2/2019: 9 a.m. – 2 p.m., St Stephen Baptist Church, 5757 Temple Hill Rd. 1/19/2019: 9 a.m. – 2 p.m., Most Holy Rosary Catholic Church, 9961 Rosaryville Rd. 2/15/2019: 8:30 a.m. – 2 p.m., St. Andrew’s Church, St. Andrews Church Rd. 1/18/2019: 12:30 p.m. – 5:30 p.m., Hollywood Volunteer Rescue Squad, 43256 Three Notch Rd. 1/17/2019: 9 a.m. – 2 p.m., Lexington Park United Methodist Church, 21760 Great Mills Rd. 1/21/2019: 12:30 p.m. – 6:30 p.m., Mechanicsville Volunteer Fire Dept., 28165 Hills Club Rd. 2/11/2019: 1:30 p.m. – 7 p.m., Valley Lee Volunteer Fire Department, 45245 Drayden Rd. 1/15/2019: 12:30 p.m. – 6 p.m., Alexandria Chapter House, 123 North Alfred St.
1/21/2019: 3 p.m. – 8 p.m., 800 Carlyle, 800 Carlyle, 800 John Carlyle St.
1/24/2019: 12:30 p.m. – 6 p.m., Alexandria Chapter House, 123 North Alfred St.
2/5/2019: 12:30 p.m. – 6 p.m., Alexandria Chapter House, 123 North Alfred St.
2/14/2019: 12:30 p.m. – 6 p.m., Alexandria Chapter House, 123 North Alfred St.
1/17/2019: 2 p.m. – 7 p.m., Avalon Courthouse Place, 1320 N Veitch St.
2/5/2019: 12:30 p.m. – 7 p.m., Walker Chapel, 4102 N. Glebe St.
2/6/2019: 3 p.m. – 8 p.m., St Thomas a Becket RCC, 1421 Wiehle Ave.
2/4/2019: 2:30 p.m. – 7:30 p.m., Springfield United Methodist Church, 7047 Old Keene Mill Rd. 2/12/2019: 1:30 p.m. – 7:15 p.m., American Legion Post 176, 6520 Amherst Ave.
1/31/2019: 2 p.m. – 7 p.m., Warrenton Baptist Church, 123 Main St.
2/5/2019: 2:30 p.m. – 8 p.m., Ashburn Fire & Rescue, 20688 Ashburn Rd. 2/1/2019: 8:30 a.m. – 2 p.m., Loudoun County Fire and Rescue, 801 Sycolin Rd. 1/17/2019: 2 p.m. – 7:30 p.m., Manassas Volunteer Rescue, 9322 Center St.
1/26/2019: 9 a.m. – 2 p.m., Manassas Church of the Brethren, 10047 Nokesville Rd. 2/4/2019: 2 p.m. – 7:30 p.m., St. Thomas United Methodist Church, 8899 Sudley Rd. 1/31/2019: 1:30 p.m. – 7:30 p.m., Dumfries Community, 15012 Dumfries Rd.